We began the day with a trip to central Santiago. I started to understand why Adam thought that Chile had a lot of similarities to the United States, because the subway and the downtown area were in many ways as nice or nicer than most cities I’ve visited in the States. Santiago’s subways system would actually be an improvement from New York’s or DC’s based on how clean it was. Our first stop downtown was Santiago’s cathedral. The history and size of the structure brought me back to my trips to Rome and Lima where I was able to see several beautiful churches that were also much older than any churches that you are likely to see in the USA. Unfortunately, we arrived right as mass was starting so we weren’t able to see much of the cathedral without disturbing the celebration. St. Francis in the church of St. Francis. He’s got a few fans. Our next stop was the church of St. Francis of Assisi, which was much smaller but just as beautiful. Following that, we took a break for lunch as a Chilean sandwich shop called Domino, not to be confused with the American pizza place. I had my first Chilean beer, which simply doesn’t compare to a lot of the great microbrews that I had while in Colorado. At least they’re trying. We spent the afternoon visiting homes of the elderly in the neighborhood. We talked with one woman who had been cheated out of most of her money by her son and was being cared for my an awesome 94-year-old man who saw her need and decided to help out. Both of them are widows. The man was particularly impressive because he had spent most of his life working in an asbestos factory, but was still looking very healthy and able to help around the house. 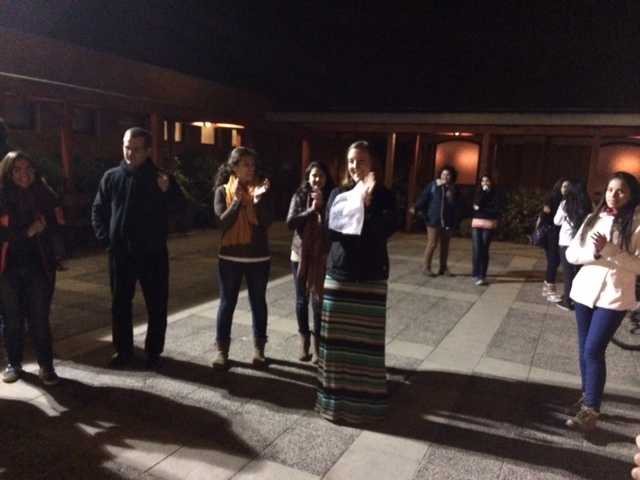 In the evening we returned to the parish for mass and Eucharistic adoration to reflect upon the day. 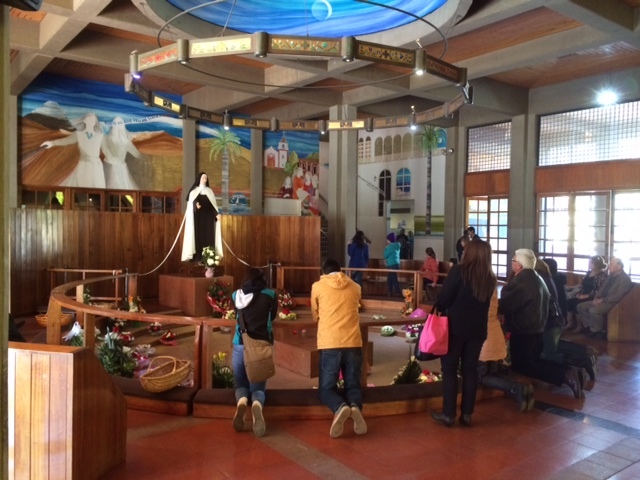 We drove north in the morning to visit the tomb of St. Teresa of the Andes and the church that her body resides in. Travelling to the mountains reminded me a lot of my home away from home in Colorado, and I loved the great views that we experienced and the tranquility that I found at the church itself. 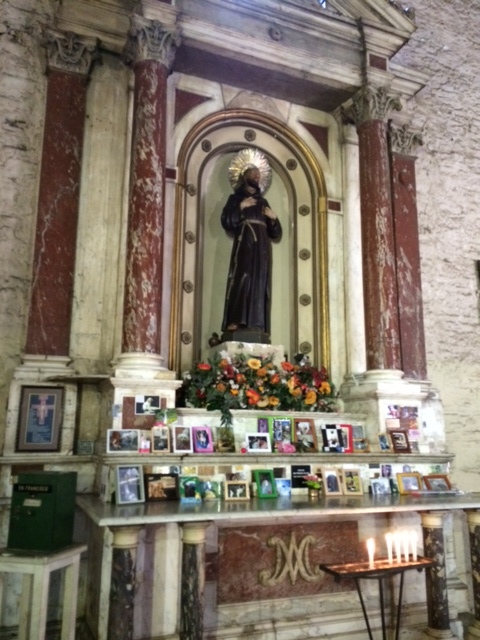 There were also some museums in the bottom floor of the church which featured many relics of St. Teresa. After mass at the sanctuary, we were treated to Mote con huesillo by Raphael, the regional superior of the Sodalitium in Chile. It’s a drink with peach juice, a dried peach, and a lot of barley at the bottom, and it is delicious. In the afternoon we returned to Maipu to visit more homes of the elderly in the community. One of the women we visited that day was completely bedridden and also losing her hearing. When we introduced ourselves, she replied “You came all the way from the United States and wanted to visit me? The Argentinians don’t even do that!” She had a great sense of humor and was a joy to talk with. The other woman we visited that day was very religious and wanted to show us her garden and her collection of crucifixes and statues of Chilean devotions in her bedroom. The garden in her backyard used to be a street, but the residents in that apartment complex slowly expanded their backyards until the street was just totally taken over. That sort of thing would never happen in the USA! We spent the evening with more young adults leaders of the parish. We discussed our mission at Christ in the City and shared our experiences. They were very amazed that we would want to do something like that for an entire year. “Did you ever feel like you were wasting a year of your life?” one of them asked us. “All of the time,” I replied. “But then I had to remind myself what my goals are in life. Having a successful career and making a lot of money is only my 4th or 5th most important goal. Becoming a saint is number one. I may have sacrificed my progress in one life goal, but I more than made up for it by growing in holiness and learning how to love those around me more fully and completely.” Adam, Halee, and I are still trying to figure out what Christ in the City would look like in Chile, and if it could even work, but talking with groups like that have helped us tremendously in understanding Chilean culture and what the concerns of young Chileans are. Later on in the evening we joined a number of our new friends at a birthday party for one of the boys in the Confirmation program. We got to listen to lots of Chilean music and eat Chilean food. I couldn’t resist the urge to start dancing merengue and bachata to the music that was being played (and teaching Halee how to do them so I would have a partner), which then prompted some of our Chilean friends to ask what a typical American dance was. Of course my first answer was swing dancing, so Halee and I showed them what it looked like while I played Bei Mir Bist Du Schoen on my phone. 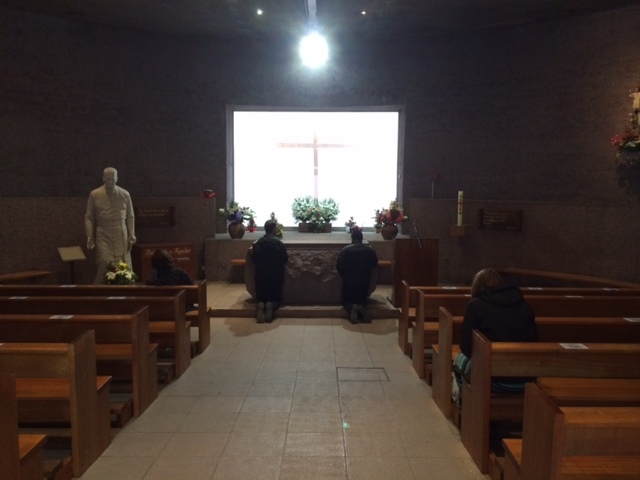 The day began with a trip to the tomb of my favorite Chilean saint, St. Alberto Hurtado. Alberto Hurtado was a Jesuit priest who lived in the first half of the 20th century and was known for his love for the homeless and especially homeless youth. He started a system of shelters called Hogar de Cristo which have served millions of Chile’s poor over the past 70 years. After returning to Maipu, we walked around the neighborhood handing out groceries to needy families. The most memorable house that we visited belonged to an old woman who owned 13 cats. The house was tiny and stunk of cat urine from the moment I got within 5 feet of the door. Along with the cats, she lives with her grandson who has cancer. When we arrived, she was very appreciative of our help. “We were completely out of food,” she told us. In the States, there were many families in need of food to help make it through the week, but I had yet to encounter a home that was just completely empty of anything edible with no money to buy anything else. Wow. 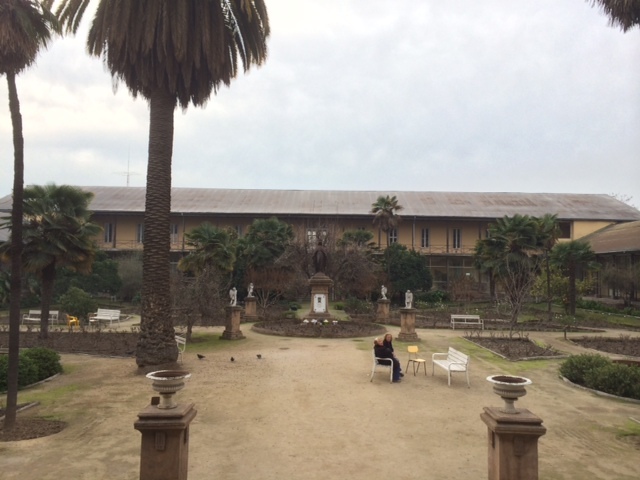 The courtyard of Fundación Las Rosas, a home for the elderly poor of Chile. Later in the afternoon we had the opportunity to meet the Servants of the Plan of God, the community of religious sisters within the Christian Life Movement. They operate a home for the elderly called Fundación Las Rosas in Santiago. The home is within a former convent and served dozens of the most joy filled elderly men and women I have ever met. They seemed so happy to have their community and to receive such a high quality of care from the sisters. It was very similar to the Mullen Home run by the Little Sisters of the Poor in Denver which I had visited many times while I was a missionary with Christ in the City. The list to get into Fundación Las Rosas is very long, and the sisters tend to only take the most poor and desperate cases- men and women who have nothing and no one at all to care for them. Halee and I learned a traditional Chilean dance at Carlos’ farewell party. That evening we attended a farewell party for Carlos, a Sodalit living in the community who was about to leave Chile to go continue his formation elsewhere. He had only been here for 3 months, but he clearly meant a lot to the teenagers here because the party was incredibly well attended. They had a slideshow of pictures, several teens spoke about what Carlos meant to them, and we all feasted on soda and hot dogs with avocado and tomatoes, a new combination for me. After the party, we watched one of the most famous Chilean movies, Machuca, which is about a young boy from a wealthy family who befriends a boy from a very poor, Marxist neighborhood. I don’t want to ruin it for anyone, but the movie showed in great detail the history of Chile in the 70s, a period where there was incredible tension and violence between the wealthy and the poor in Chile. It helped us understand why there is still a lot of distrust and hatred between the different economic groups in Santiago today. I think one of the goals of CIC Chile will be to work to heal those wounds. The Sodalits have already been working to bring those two worlds together through their missions, since they currently have two parishes in Santiago- one in Maipu among the poor, and another in the wealthier part of Santiago. May you continue to tread where the Holy have been before you, and be successful in sharing your inspiration and love.